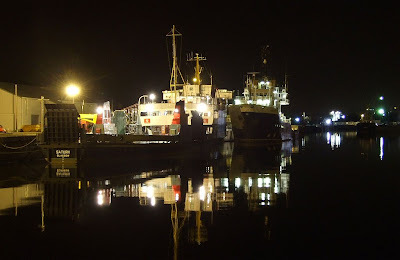 Two ships awaiting drydocking are both alongside the Garvel Drydock's berth in the James Watt Dock at Greenock tonight. Caledonian MacBrayne's SATURN is currently undergoing her annual Passenger Certificate survey, while the Northern Lighthouse Board's POLE STAR lies just ahead of her, also waiting a slot in the drydock. Obviously wasting no time with Polestar as most of her hull has now been shotblasted. Hope the moaners in the new flats are not too upset by the noise.